Is it a brownie or is it a cookie? 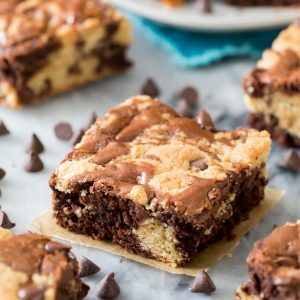 These Brookies are a chocolate chip cookie/brownie hybrid. 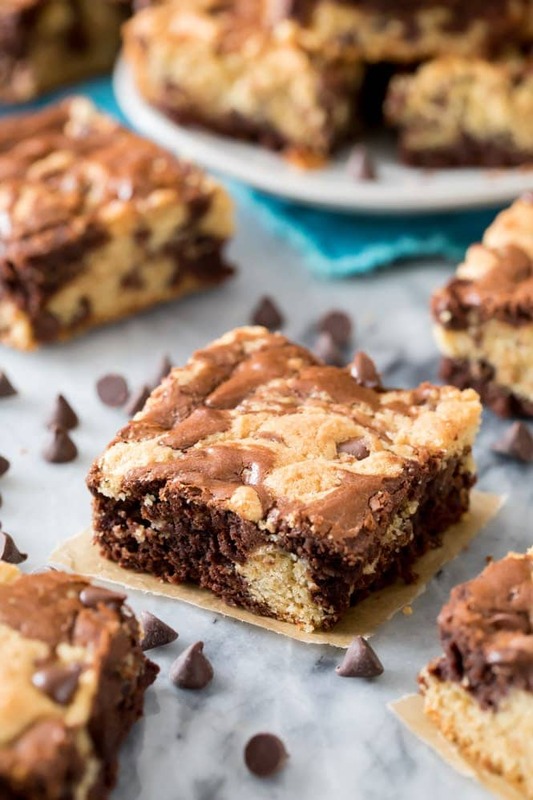 With patches of fudgy chocolate brownie and chewy chocolate chip cookies, these Brookie Bars are the best of both worlds. 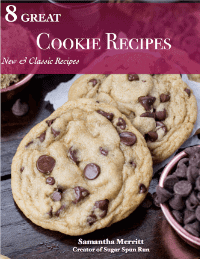 Today we’re teaming up Chocolate Chip Cookies with my favorite Brownie Recipe to make Brookies. These two worlds collide to make a decadent treat that’s the perfect marriage of cookie and brownie. Can you think of a better way to kick off the weekend? Served brownie-style (/in a pan), this recipe has swirls of fudgy, chocolatey brownie and chewy chocolate chip cookies. 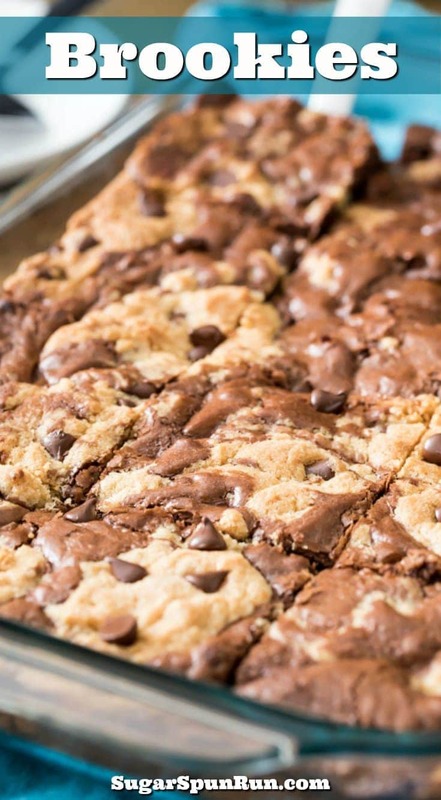 Brookies are easy to make; you don’t need a mixer for either the brownie batter or the cookie dough. There’s no chilling required, and everything can be baked in just one pan (perfect if you don’t feel like scooping a ton of cookie dough). However, I still don’t feel right calling them a “lazy day recipe” (like my Oatmeal Cookie Bars). We’re still effectively making two different batters, and so that means twice the dishes than if you were just making brownies or cookie bars. Fortunately the brownies can be made in just one bowl but you’ll still have three bowls to wash when all is said and done. Just a fair warning for anyone else who hates doing dishes as much as I do. Start by making the cookie dough. Combine melted (cooled) butter, sugars, eggs, and vanilla and stir well. 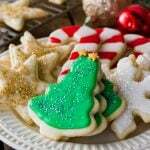 Combine the dry ingredients separately and then stir the wet and dry ingredients together to make your cookie dough. Don’t forget to stir in chocolate chips! Next, make your brownie batter. 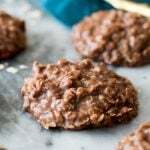 Melt together chocolate chips and butter, then stir in cocoa powder. Add sugars, eggs, vanilla extract, and salt and stir well. Finally stir in your flower. Assemble. Lightly grease a 9×13 baking dish and alternate dropping large spoonfuls of brownie batter and cookie dough into the pan. I like to use ice cream scoops or large cookie dough scoops, but just try to make the dollops about the same size. 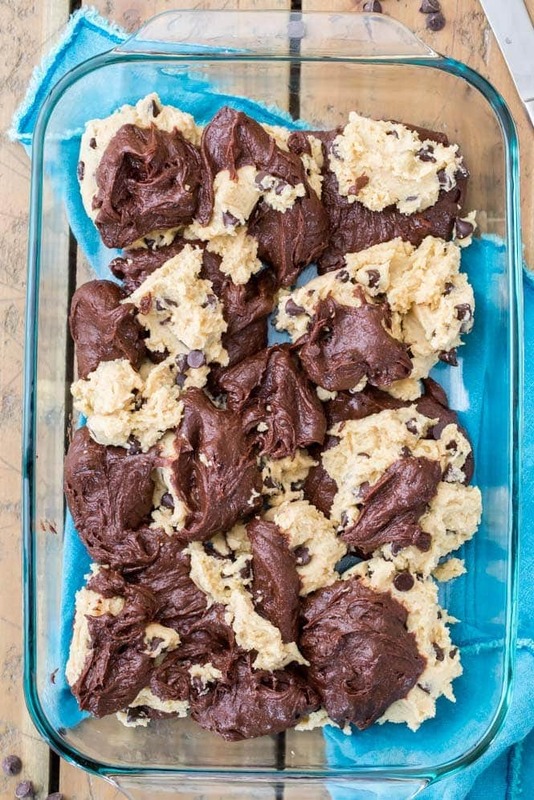 Use a knife to swirl the cookie dough and brownie batter together. Make sure the dough is evenly distributed over the pan and there are no patches where dough is missing. 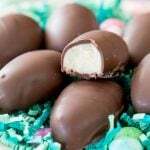 Top everything off with additional chocolate chips, if you’d like! Bake. It’s very important that you don’t over-bake your Brookies or they’ll end up dry and crumbly. Use the toothpick test to check that they are done, but make sure you’re not accidentally sticking the toothpick in a chocolate chip. Do a few tests around the center. If the toothpick comes out clean, the Brookies are definitely done baking, but preferably you’ll catch them a few minutes before the clean toothpick stage. 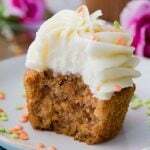 Ideally you want the toothpick to come back with a few fudgy/moist crumbs (not batter), this means they are finished and not over-baked, and they’ll be soft and chewy when cooled completely. Anyone else want to top a warm Brookie slice with ice cream or is that just me? 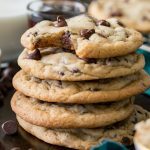 Chewy, chocolatey BROOKIES are a chocolate chip cookie/brownie hybrid! 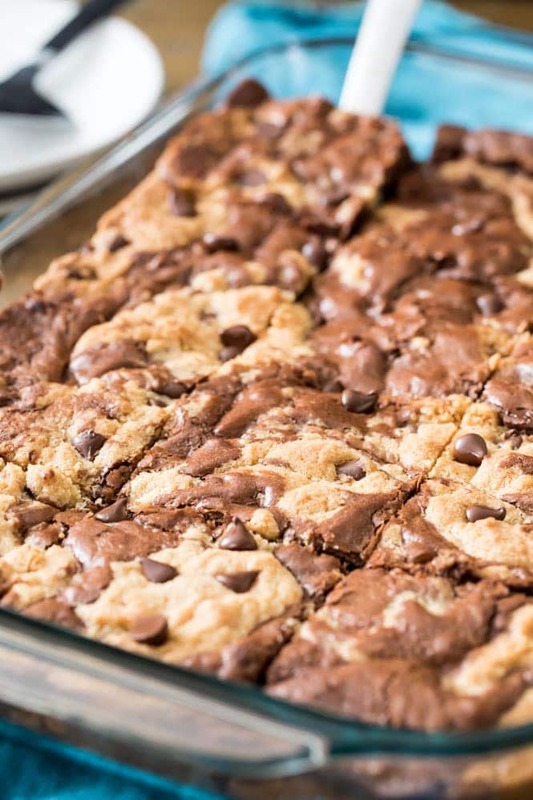 Loaded with chocolate chips and swirls of fudgy brownies and chewy cookie bits! 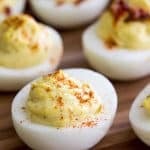 Be sure to check out the easy how-to VIDEO below the recipe! Preheat oven to 350F (175C) and lightly grease and flour sides and bottom of a 13x9 baking dish (or spray with baking spray). Set aside. Combine melted, cooled butter and sugars in a large bowl and stir well. Add egg, egg yolk, and vanilla extract and stir again to combine. Set aside. Add dry ingredients to wet and stir until completely combined. Stir in chocolate chips. Set aside and prepare your Brownie batter. Combine butter pieces and 1/2 cup chocolate chips in a large heat-proof bowl. Transfer to microwave and heat in 20-second intervals, stirring very well in between until chocolate and butter are completely melted and mixture is smooth. Add eggs, egg yolk, vanilla extract, and salt and stir to combine. Add flour and stir until well mixed. If desired, stir in mini chocolate chips. 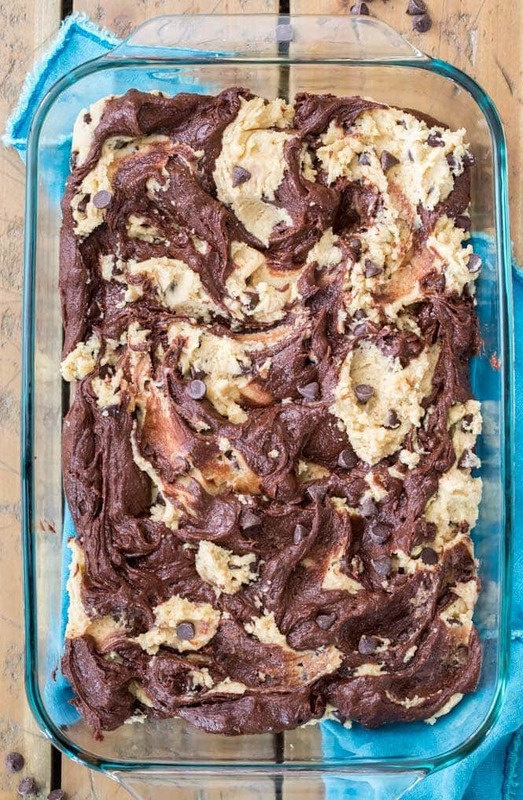 Alternate dolloping large spoonfuls of cookie dough and brownie batter into baking dish. 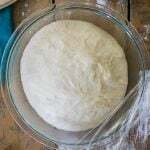 Use a knife to swirl through both doughs and make sure the batter is in an even layer. Transfer to 350F (175C) oven and bake for 35-40 minutes or until a toothpick inserted in the center comes out with a few moist crumbs or clean (make sure you're not sticking the toothpick into a chocolate chip!). Take care to not over-bake your brookies or they will be dry and crumbly once cooled. 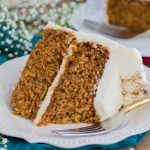 Allow to cool and slice and serve. Enjoy! 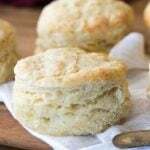 ¹The butter should not feel too warm to the touch or it will melt your sugars. 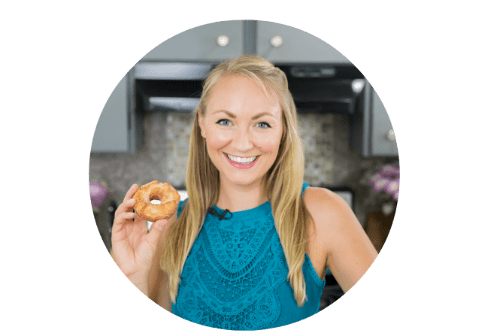 I absolutely LOVE your food blog, along with the videos. 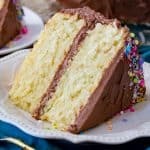 Thank you so much for sharing these recipes! In England we don’t use cornstarch, what is the next best thing to use. Love Brookies. Truthfully, I have been making them for absolute years. In fact, I nick-named them Brookies because it was the nickname of my son-in-law’s boss.